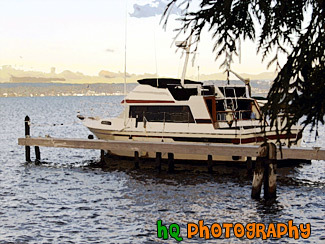 A photo of a boat waiting to be used in Lake Washington, Washington. Lake Washington is one of the biggest and most popular lakes in the Seattle, Washington area. This lake touches cities such as Kirkland, Shoreline, Seattle, Renton, New Castle, Bellevue, and Mercer Island. A lot of activities take place in this lake and is a joy amongst the residents of the state.